Jackie Kennedy fans, this one’s for you. A historical novel set in 1960’s New England’s elite world of political families, the main character Tiny Hardcastle navigates her pristine world through a maze of blackmail, secrets and affairs. The point of view alternates between socialite Tiny Hardcastle, and Frank’s cousin Caspian, a Vietnam war hero who is the only man privy to Tiny’s inner life. As Tiny tries to maintain her high society Hardcastle façade, someone is trying to blackmail her with damning photos from her past, while she suspects her husband Frank, has secrets from his college days. If the secrets become public, it will undo the couple’s perfect power couple façade, ruining Frank’s chances for obtaining a Senate seat. I enjoyed this character driven novel, especially Tiny, who develops so much inner strength and growth. Diaz seamlessly includes what is associated with the Upper Crust – a large beach front family compound, weekly deliveries of out of season flowers, Lily Pulitzer dresses, constant cocktail parties and a forgotten 1930’s Mercedes-Benz sitting in a shed. I highly recommend Tiny Little Thing. Beatriz Diaz has a gift for intriguing and refreshing storytelling. 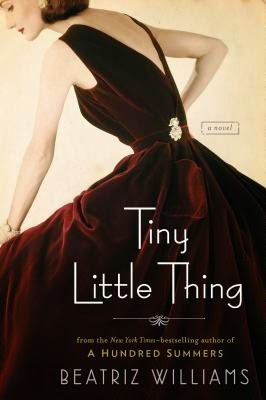 Tiny Little Thing is an enjoyable romance novel with elements of suspense and drama. An ARC was provided to me by Netgalley in exchange for an unbiased review.